Because this 54 VDC supply is based on a bank of four each 13.5 vdc supplies all in series, if one of them should fail while I'm using it, I want the system to react automatically. 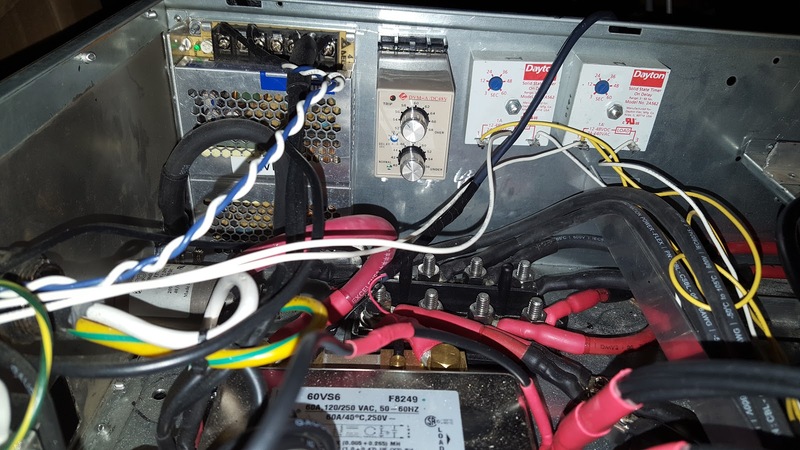 It's fairly simple to just monitor for a particular voltage and if it changes out of a small range up or down then we know something is 'wonky' and we need to react. I looked into creating my own circuit for this, and decided that I simply didn't want to do it myself, so I looked around for options and found a place in China who sells just what I wanted both on Amazon, and on Ebay. I decided to give them a try about 2 weeks ago, and I ordered two of them. They cost $33 USD each. Kinda pricey, for what it is, but these devices look like they'll fit nicely, and then also include a time range so if there's just a brief voltage change a reaction can be delayed from 1-15 seconds. So for example if set to 15 seconds, and there's a voltage change for 3 seconds but then it goes back into the OK range then nothing happens. Like a buffer. Here's a little video demo of this device functioning.